This grain—along with the red and purple varieties—is becoming increasingly popular in the United States, and has long been consumed throughout Asia. Black rice is a 100% whole grain food just like brown rice, but it is thought to have a higher anthocyanin content due to its deeper color. 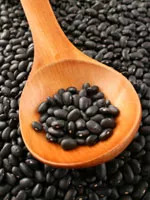 A study in China found that when people's diets were supplemented with black-rice pigments, their risk factors for cardiovascular disease decreased–including levels of C-reactive protein in their blood, an indicator of inflammation. These high-fiber antioxidant powerhouses pack more disease-fighting power than lighter-colored beans. New research shows that the black skins contained 24 plant compounds including 12 terpenoids and 7 flavonoids. The researchers also found that these compounds halted the growth of colon, liver, and breast cancer cells. It comes from the same plant as green and oolong tea, but the dark stuff has a slew of good qualities all to its own. Numerous studies have shown that drinking several cups of flavonoid-rich black tea a day may provide heart-health benefits, offer protection against neurological decline as we age, and provide anticancer properties. Plus it's got the added benefit of being calorie-free (as long as you don't drink it with milk and sugar), and its caffeine may help improve your workout. These tangy treats are rich in polyphenols that have been shown to have antioxidant activity. University of Kentucky researchers isolated blackberry extract in lab studies, and found that its chemicals stopped the growth of colon-cancer cells. They may also help prevent diseases related to chronic inflammation. Don't like them on their own? Pair them with blueberries and ginger syrup in this light and fruity dessert. Black mushrooms, potatoes, carrots, and many other specialty black crops are, well, cropping up these days. Let us know if you've seen any at your local farmers market and whether you've tried them.